They made their way to the mound as darkness fell. Within the horseshoe of stones they could see the hag hunched over her fire, the hot flames licking the prize they sought. It towered over the old woman, nine pieces of iron linked together. On one end a hunk of red raw meat, in the center a hunk of dressed meat, and on the far end a wedge of butter. It might have been the cooking fire of any poor herdsman or farmer, and not a Goddess. But the thieves knew that food from this cooking fire was unending. No matter how much a man ate more appeared, and to eat from it was to gain the wisdom of the Morrigu, the raven mother, lady of battles. The boldest of the thieves crept closer, not noticing the old crone tilt her wrinkled head as if listening to the wind. Closer now he saw the woman’s eyes were glazed over, blind. Her hands curled and knobby with age. Taking such a magickal treasure should be a simple task. But as the man reached out, hand ready to claim his prize the woman spun towards him and stood. The woman who looked at him now was not the hobbled old hag, she stood talk and imposing, her dark raven hair billowing in a wind in an unearthly wind, her limbs young and strong, her face terrible and unimaginably beautiful all at once. He coward, unable to move in the presence of such a being. “If you had only asked Me for my treasure I would have freely given it, but instead you approached me as an outlaw in the night.” she said. Her voice was as sweet as the notes of a harp, as harsh as the cry of ravens upon the battlefield. Symbols are important, they speak to us on a primal level. They embody the essence, character, and mysteries of a deity. In our worship, whether it be designing a ritual or creating an altar, we use them to further our connection to deity and to draw upon their power. Many of the Morrigan’s symbols we already know. Crows, ravens, cattle and horses being the most well known. As a Goddess connected with death ,skulls (animal or otherwise) are also a popular symbol connected to Her, as well as the cauldron (such as the one Badb stirs) representing transformation and rebirth. I would add the torc to that list, as I often use it in rituals dedicated to the Morrigan as a Goddess of sovereignty. But one symbols in particular that is connected to the Great Queen in her myths is often overlooked, the Morrigan’s cooking spit. At first this seems like an odd symbol to connect with the Morrigan, but it appears several times in her mythology. This magickal cooking spit was said to hold three types of food on it, a piece of raw meat, a piece of dresses meat and butter. In Gods and Fighting Men Lady Gregory recounts a story in which nine outlaws beseech the Morrigan for the spit (or steal it from her). The spit could be broken down into nine pieces and each man carried a section of it during the day, while at night they gathered together to reassemble it. “As to the Morrigu, the Great Queen, the Crow of Battle, where she lived after the coming of the Gael is not known, but before that time it was in Teamhair she lived. And she had a great cooking-spit there, that held three sorts of food on it at the one time: a piece of raw meat, and a piece of dressed meat, and a piece of butter. And the raw was dressed, and the dressed was not burned, and the butter did not melt, and the three together on the spit. The spit appears again in her interaction with the hero Cúchulain. Before Cúchulain’s final battle the Morrigan appears to him along a roadside as a hag cooking dog flesh on a cooking spit. There are several versions of this encounter and how she tricked him into eating the flesh of his namesake, the dog. In one she attacks the hero with the spit, perhaps to goad him into taking action. The Triads of Ireland (number 120) makes mention of the three appliances of a blacksmith, which are "Three things constitute a blacksmith, Nethin's spit, the cooking-hearth of the Morrigan, the Dagda's anvil." In County Tipperary we find a fulachtas mound called by the same name, Fulacht na Mór Ríoghna or “The Cooking Pit of the Mórrígan”. 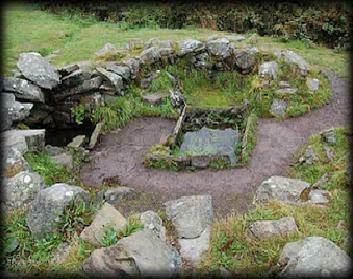 Fulachtas (FULL-ahk FEE-add) or burnt mounds are found throughout Ireland, England, and even Scotland. They are low horseshoe shaped mounds with a depression in the center, accompanied by heat shattered stones and charcoal enriched soil. It is uncertain exactly what purpose they served but it is generally believed that they were used as outdoor cooking areas. Who exactly these outlaws are is debatable. Rouge warriors? Thieves? And why does she give such a magickal item to them? Why does she use the spit to attack Cúchulain? Some have suggested that the spit and its unending supply of food represent the Morrigan’s function as a fertility goddess. Dagda who is also connected to fertility and abundance possesses a similar spit. But the fact that Morrigan uses this magickal tool as a weapon should also not be overlooked. She uses it to prod Cúchulain into action, into accepting his destiny and the path he has chosen for himself. The Great Queens lessons are often hard, and it does seem a fitting tool for her. She is using a proverbial cattle prod to get us off our spiritual butts. And in truth sometimes we need this. All too often we are afraid to take those crucial steps forward in our spiritual development, or to move forward in our lives. The items on the cooking pit are intriguing. The raw meat, the dressed meat and butter may symbolize abundance, as they are constantly replenished. Another interpretation could be that they represent the stages of transformation, the raw meat being a state of raw beginning, the dressed meat the process of learning, and the butter transformation or attainment of knowledge. That the spit brakes down into nine pieces is also no surprise, as the number nine is connected to the Morrigan several times, again hinting at a connection to transformation. Eating or drinking from magickal items, or eating the flesh of magickal animals is often a vehicle of attaining wisdom in Celtic myths. Drinking from holy wells, eating the Salmon of Wisdom, were all ways to attain such wisdom. In other stories gods or spirits shape shift into animals and are swallowed (usually as flies), their spirits entering an unsuspecting woman in this manner and the god then reincarnated as the child of the mortal. Etain is reborn in this manner, she is transformed into a beautiful fly which is swallowed by a mortal queen who soon becomes pregnant with the Goddess’s mortal incantation. Morrigan’s spit and the food on it may have had a similar function, granting wisdom, or another of the Morrigan’s attributes, to those who ate from it. I have been practicing for over 40 years. I am now able to face the Morrigan. I am reading Dark Goddess....and I am enjoying every minute of it. Am I prepared to take this journey? No, but the book will help I am sure. There will be much preparation before I meet her face to face. October 26th, 2012 will mark the end of my first year on this path. It has taken the entire time for me to realize that The Morrigan is my Goddess. A good friend pointed something out that showed me that She was the one who brought me to this path in the first place. For me, this article affirms that She is the one I am to follow. And that She has been there from the beginning. I now see so many ways that She was trying to guide me, and teach me. Especially the "cattle prod" method (highly necessary in my case). While I can understand "how" people can fear her; I do not understand "why" people fear her. The very same qualities that cause people to fear her, are the ones that cause me to love her. "While I can understand "how" people can fear her; I do not understand "why" people fear her. The very same qualities that cause people to fear her, are the ones that cause me to love her." I agree with this very much, I love to research and learn as much as I possibly can about things and I've found similar themes regarding The Morrigan everywhere I look. She does not frighten me, I feel as though she embraces and protects me while encouraging me to strive for the things I want in life - to become my very best.